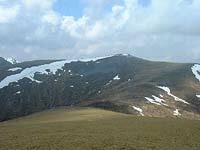 Carn nan Gobhar is the more central of three Munros enclosing Coire Mhuillidh. To the N are easy slopes to Strathconnon from where a path ascends to over 600m. 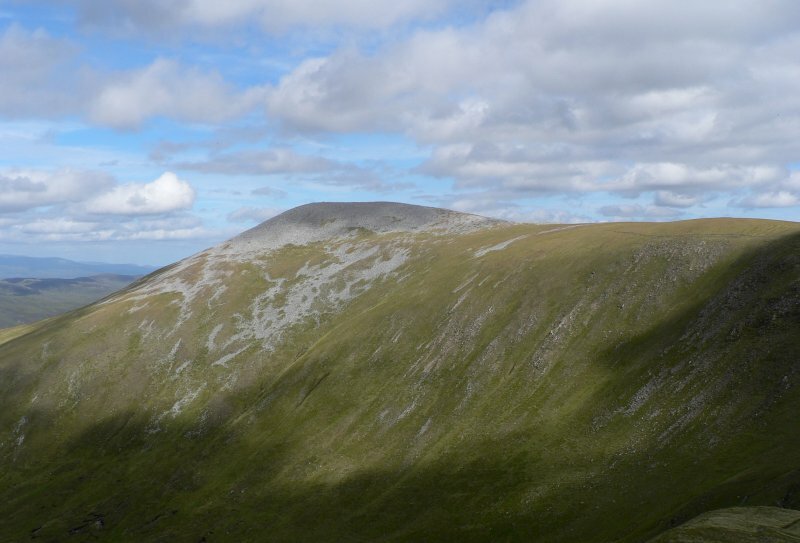 The curved summit ridge runs SW from the summit then divides into a short narrow W branch connecting to Sgurr a Choire Ghlais and a longer broader S branch to An Socach overlooking Coire Mhuillidh. At the E end of the summit ridge a S branch connects to Sgurr na Ruaidhe and a NNE branch leads down to Meall na Faire. 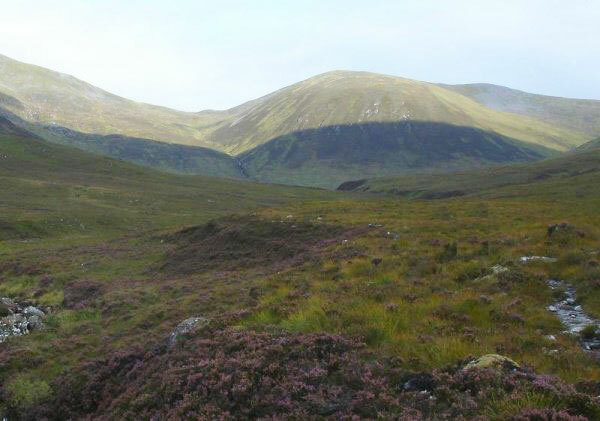 Between these ridges there are steep slopes into Coire na Sleaghaich, but otherwise slopes are moderate and accessible. Access is invariably from Sgurr a Choire Ghlais or Sgurr na Ruaidhe. Carn nan Gobhar from Sgurr a'Choire Ghlais. Sgurr a' Choire Ghlais and Carn nan Gobhar from Sgurr na Ruaidhe; February 1985. 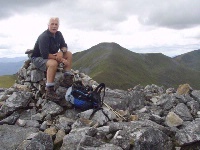 The summary information of one or more ascent routes that include Carn nan Gobhar [Glen Strathfarrar]. 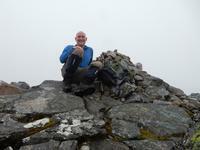 James at summit of Carn nan Gobhar with Sgurr a` Choire Ghlais in background. 19/08/2012. 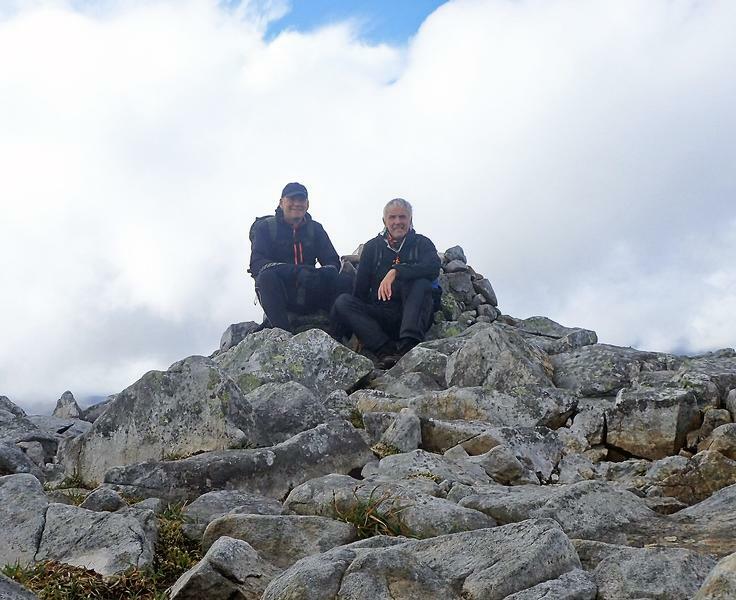 Rocky summit of Carn nan Gobhar. 19/08/2012. Beautiful day. 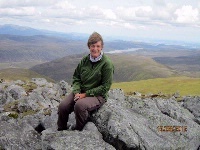 Post a few words about Carn nan Gobhar [Glen Strathfarrar] or read what others have had to say. Easy route starting at West end where stackers path runs to almost 1st summit, met another walker waiting for gate to open at 9am and we dropped a car at descent route, wouldn't like to walk back up the roadway to the start, easily around the 4 Munros and back to roadway in 6 hrs, if you don't have two cars take a bike, Loads of time before the gate is locked, but if late back three appears to be quite a bt of local traffic inside the gate with their own keys.